d) Router configuration and other networking area like VOIP, Frame Relay multiplexes, OSPF, SNMP. e) Knowledge in VSAT Equipment, Types of Modems & site related works related to Antenna & VSAT. f) Knowledge in the field of RF Communication / IT Hardware & Software / Networking / Testing / Maintenance of Network. g) Knowledge of UPS, Isolation Transformer, Electrical Cables & Wiring etc. Reservations & Age relaxations will be as per Govt. directives for SC/ST/OBC/PH. Class: 1st class is relaxed to 2nd class with 50% marks in aggregate for SC/ST. Age: 5 years for SC/ST; 3 years for OBC. 5 more years relaxation in PH category. Eligible candidates may download the application format from our website www.ecil.co.in and attend the Interview on 10.05.2017 from 0930 hrs. to 1200 hrs. 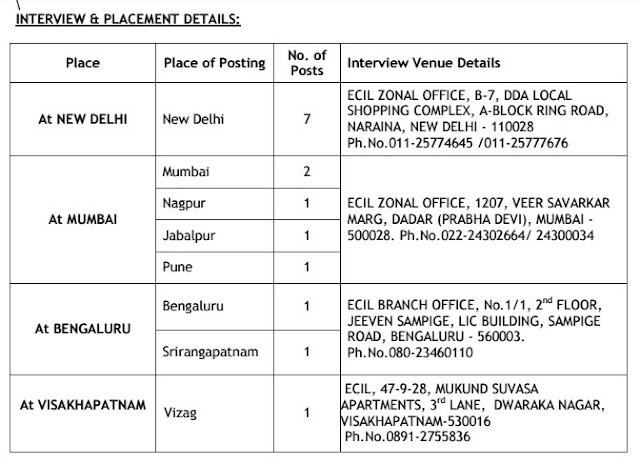 as indicated at “Interview Venue Details” above. The eligible candidates should attend with duly filled in application form along with all original certificates in support of date of birth, qualification, experience and caste etc., with one set of photocopies and recent passport size colour photograph. The selection will be based on interview performance / experience etc. ECIL reserves the right to cancel/restrict/increase/modify the vacancies notified/recruitment process if need so arises, without assigning any reason.